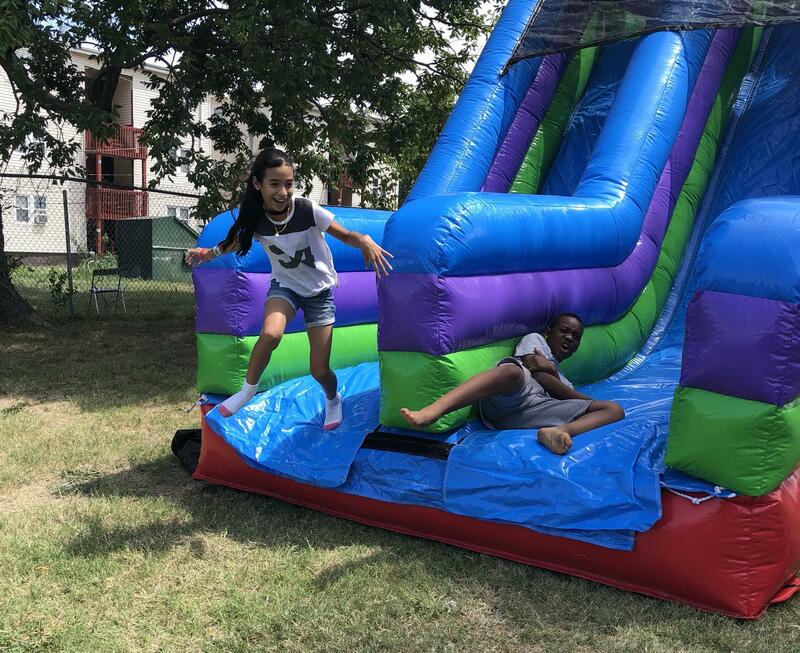 Two Kansas City Public Schools students race down the bounce house slide at Summerfest, the district's back-to-school fair. Last Saturday, an emcee pumped up the crowd at Summerfest, the Kansas City Public Schools Education Foundation’s back-to-school event. “I’m going to point at you, and y’all are going to say, ‘I just came here to have a good time,’” he called. It was a good weekend for KCPS. More than 5,000 families came out to pick up backpacks and enjoy a free lunch. 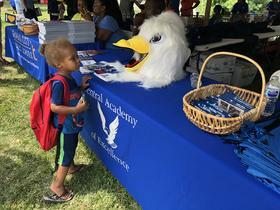 “To us, it's a friendly reminder that people want to get their kids ready for the first day of school,” said Nicole Collier White, the director of the KCPS Education Foundation. 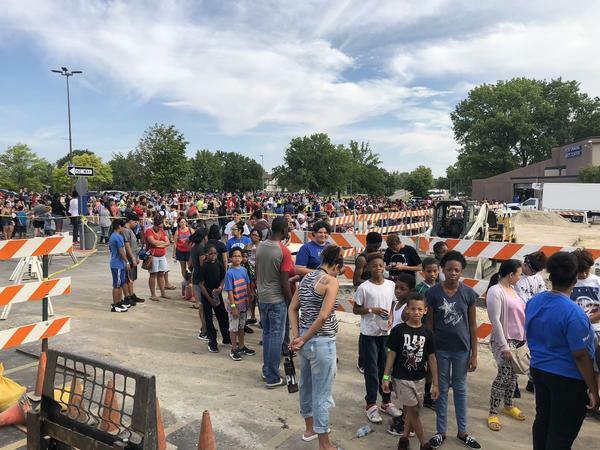 Wyandotte County has been putting on its back-to-school fair for a long time – more than 20 years. “We’re actually trying to remember what year we actually started this,” Arlana Coleman, one of the event’s organizers, said with a laugh. What started as a school supply drive has grown every summer. When organizers realized kids weren’t getting all their immunizations, they brought in nurses from the Unified Government to give them. When they learned a lot of students had never had a physical, they called KU Med. When kids who failed the vision screening the summer before never got glasses because their families couldn’t afford them, they partnered with Cerner to hand out vouchers. And families line up to receive these services. Five-year-old Marriona’s family had been waiting for over an hour when the back-to-school fair opened at 9 a.m. Saturday morning. But Marriona was so excited about starting kindergarten she remained in good spirits. 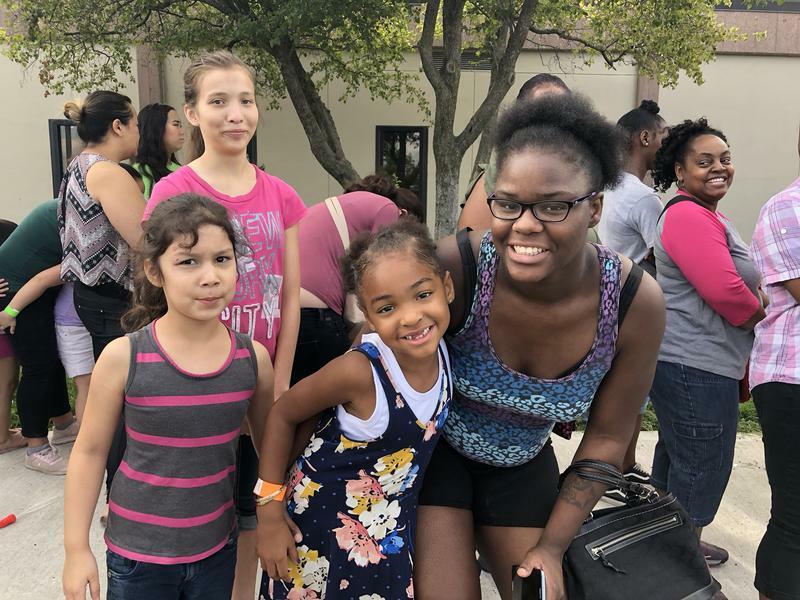 “I’m going to learn my ABCs and learn math and my one and two and three and four and five and six and seven and eight,” Marriona declared, the line to get into the fair now snaking around the Johnson County Community College parking lot. Three summers ago KCPS decided to get in on the action. According to Collier White, there are many misconceptions about families who can’t afford to buy their children school supplies. 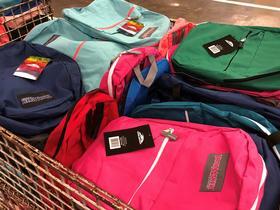 Though organizers try to make these back-to-school fairs bigger and better every year, free school supplies are still the main draw. KCUR’s Up To Date program took the KCPS supply list to Target to see just how much school supplies cost. A family would have to spend about $35 to buy everything a kindergartener needs for school, and it only gets more expensive as kids get older. By the time a student reaches high school, calculators and flash drives can push the back-to-school bill over $100. And that’s without buying clothes, shoes or a winter coat. “If you can’t afford to buy school supplies and get a uniform t-shirt, we’re removing barriers,” Collier White said. But there’s another reason districts are inflating bounce houses, grilling hot dogs and cranking up the volume at these back-to-school events. Low-income families tend to move a lot, especially over the summer. 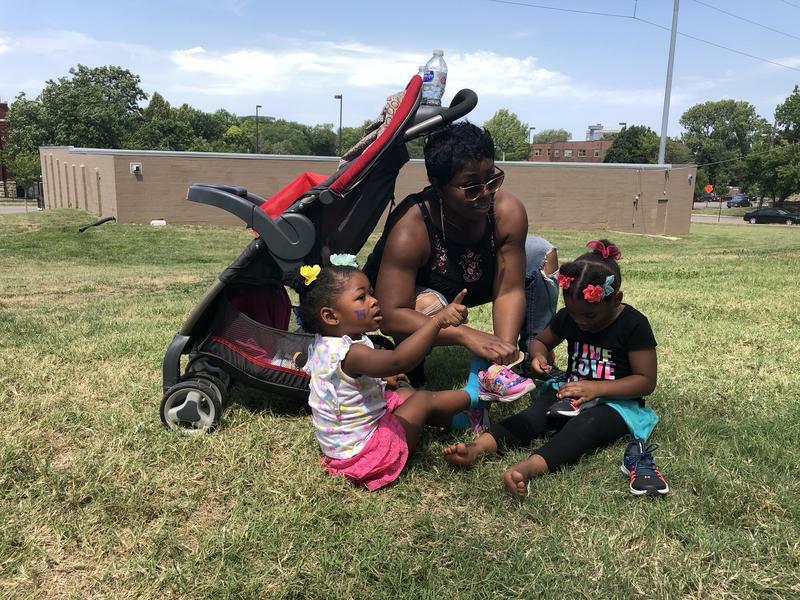 For years, Kansas City’s urban school districts have struggled to get families to enroll before the first day of school. “It can be difficult to remember, ‘Oh yeah, I got to get my kid registered because we start school on the 13th.’ Sometimes it does sneak up on you,” Collier White said. KCPS estimates that 40 percent of the students it enrolls each year did not attend a KCPS school the year before. Getting new-to-the-district families to come out to Summerfest ensures those kids will know which school to go to on the first day back. Their immunization records will already be on file. They’ll have a backpack and a school uniform. In other words, they’ll be ready to learn. Just about everyone hosts a back-to-school event these days. Center School District’s fair was last weekend. Hickman Mills’ is Saturday. Shawnee Mission was offering free haircuts to school-age children earlier this week. And for the first time, Jackson County is hosting a big, back-to-school blowout as well. Building on a smaller-scale event that Fort Osage has held for its students, the Jackson County Sheriff’s Office is trying to reach all families in need. Community Resource Officer Raashid Brown says from what he’s seen, it’s easier to hide poverty in the suburbs than it is in the city. “So the same issues they have in the city, they have in Eastern Jackson County. Unfortunately, for years, people in Eastern Jackson County have had to travel towards the Independence or the Kansas City, Missouri, or the KCK to get these resources,” Brown said. The countywide back-to-school bash is 10 a.m. to 2 p.m. this Saturday, August 11, at Osage Trail Middle School, 2101 N. Twyman Rd., Independence, Missouri 64058.